One of the most frustrating types of fat is belly fat. This fat is not only stubborn, but it comes on slowly and it can take forever to lose, and most times only after endless dieting and driving yourself to exhaustion at the gym. 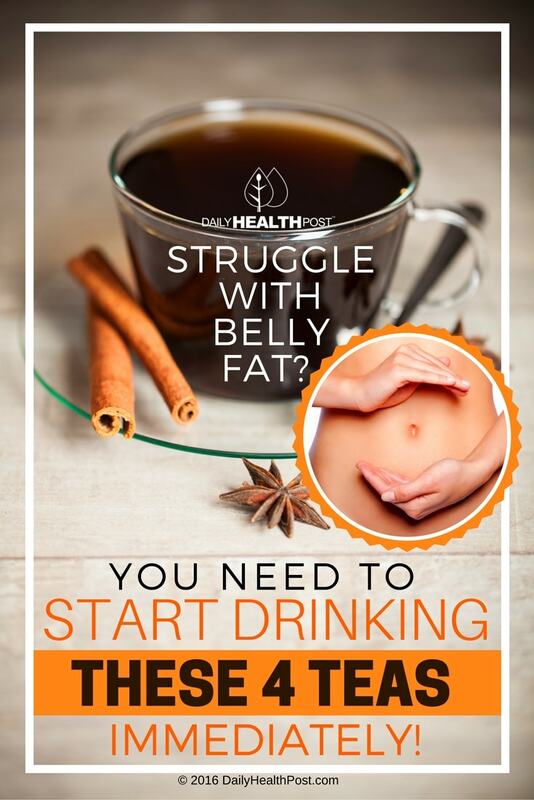 But what if regularly drinking tea can actually help you shed that extra belly fat and more? Well, good news, it can. And here are 4 of the best belly-busting teas you can drink to shed those pounds and boost your metabolism! These 4 teas are delicious and healthful. Try each one and see what works for you! This highly prized tea is made by fermenting the leaves of the Camellia sinensis plant and storing it for long periods of time in a high-humidity environment (1). In fact, while other teas get stale over time, Pu’er tea mellows and simply improves with age, just like your favorite fine wine. You can even find some Pu’er teas that are more than 50 years old! The rarest Pu’er teas sell for thousands of dollars in Asian specialty stores. But what really makes this tea so valuable are its incredible health benefits. While this tea has less antioxidant content than white or green teas, it is widely known for its powerful weight loss properties and its ability to reduce your cholesterol levels while protecting your heart. Several studies show the powerful catechins, caffeine, and theanine in Pu’er tea are responsible for its anti-obesity effects (2). A Chinese 2009 study published in The Journal of Agricultural and Food Chemistry also reveals the incredible cholesterol lowering effects of this tea. It shows that animals fed a PTE have lower LDL (“bad”) cholesterol and triglyceride levels and even an increase in their HDL (“good”) cholesterol (5). Other studies show these lowered cholesterol effects are likely a result of the manner in which this tea is aged. Microbes that form during the aging process create lovastatin, a natural statin, which can be used medicinally to lower bad cholesterol such as LDL. Studies even show the longer this tea is aged, the more statins it produces (6). Cinnamon is a wonderfully zesty spice that also works to help you lose weight and belly fat in several ways. First, it helps to control your insulin levels. Whether you are diabetic or not, it is important to regulate your blood sugar levels as spikes in either direction can be dangerous. Increased blood sugar levels can cause your body to store excess fat, which makes it harder to maintain or lose weight. Drinking cinnamon tea, or even sprinkling a little cinnamon on your food, can help to regulate your insulin levels so you don’t have excess fat buildup. Cinnamon also helps to lower LDL cholesterol (7). Cinnamon is a great way to help your body better metabolize carbohydrates so they don’t turn into excess fat. This is important because high glycemic index foods spike your glucose levels, which can lead to fat buildup. Other studies also show that eating cinnamon causes a metabolic reaction similar to eating hot peppers. It essentially speeds up your metabolism, which allows you to burn more calories and lose more weight. A 2012 study published in the International Journal of Preventative Medicine shows that people with type-2 diabetes who take daily cinnamon supplements lose more weight and body fat than a placebo group, even without making any changes to their usual eating habits (8). Cinnamon also slows the passing of food from your stomach into your intestine, thus making you feel full longer, which of course, can also help you to lose weight (9). If you are not familiar with fennel, it is a wonderful spice with a licorice-like taste. Apart from its ability to help you lose weight, fennel has numerous other health benefits including being a powerful breath freshener. It is characterized as a potent stomachic (promotes appetite or assists digestion), carminative (relieves flatulence), galactogogue (increases breast milk), anti-spasmodic, anti-inflammatory, anti-microbial, expectorant, diuretic, emmenagogue (stimulates blood flow in the pelvic area and uterus), depurative (purifies and detoxifies), anti-carcinogenic and antioxidant (10). That’s a lot of healing for a tiny seed! Plus, fennel also helps to boost your metabolism and break down fats, releasing them into your bloodstream to be used as energy. You can often find fennel added to weight loss supplements because it is a powerful diuretic that helps to flush out excess fluids and toxins (12). As an added bonus, you can also reduce those puffy morning eyes caused by fluid retention just by applying strong fennel tea under your eyes. While there are three major types of ginseng, each with their own unique attributes, there are really only two that are true ginseng—American and Asian. Ginseng, in general, is an adaptogen traditionally used to increase energy, stimulate your immune system, and increase longevity (13). When it comes to weight loss, one study published in Phytotherapy Research Journal shows that a constituent in red ginseng can actually inhibit fat storage (14). Another study published in the same journal shows that wild ginseng can not only promote weight loss but lower your blood glucose levels, another factor linked to excess fat (15). Researchers did a follow-up study to this 2008 study and further showed that specific saponins in ginseng may help to normalize chemicals linked to weight gain (16). You can drink any of these teas on their own or you can even find blends that include all or some of the above teas. But not all teas are equal in quality or price so you need to know what to look for when choosing teas. Organic teas are always best as you can be sure they are not sprayed with chemicals. This helps to eliminate pesticide exposure, which can lead to obesity (17). Pick loose-leaf or loosely packed whole leaf teas, as they tend to be higher quality. Loosely packed teas also allow the tea to breathe when brewing thus extracting more of its healing qualities. Chose a brand you recognize or one that is backed by a naturopathic doctor, herbalist or tea specialist for example. Finally, always store tea in a dark area in a sealed container to ensure its freshness and potency.